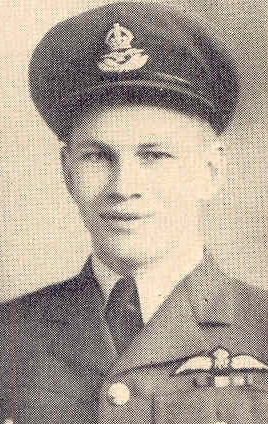 On August 14th 1941 enlisted in the RCAF in Winnipeg then took the short journey to No. 2 Manning Depot in Brandon Manitoba. By January of 1942 he was at No. 4 ITS in Edmonton. The results of the testing at ITS put Eyjolfson on track to becoming a pilot. Pilot training began at No. 5 EFTS at High River Alberta followed in June at No. 3 Service Flying Training School in Calgary Alberta. By October 9th 1942 he received his wings. Leaving Halifax for the dangerous crossing of the Atlantic which would bring him to No. 3 PRC in Bournemouth. Additional training continued at No. 82 OTU and No. 22 OTU. Sgt. Dujay was replaced by Sgt. Cossar and F/O Beauchamp was replaced WO McCaughey after the first two operations. During this operation Sgt. Pattie responded to problems that the crew's Flight Engineer, Sgt. Davidson RAF, for reasons not mentioned passed out twice during the flight. While on operation on the night March 25th. the Halifax Eyjolfson was piloting JP125 lost both engines. Eyjolfson jettisoned the bombs and turned the aircraft back to RAF Ford where shortly after nine p.m. the Halifax crash landed. The aircraft overshot the runway hit a shed then ploughed into a field. The aircraft mainplanes were torn off, engines were torn from their nacelles and the fuselage was heavily damaged. Fire broke out leaving the Halifax as a category "E" meaning it was a write off. P/O Eyjolfson, Sgt. Tunstall, Sgt. Pattie, and Sgt. Cossar were all injured, reports mention that injuries were minor. F/O Siddall spend longer in the hospital then the others. He had an injured spine also a fractured pelvis. The Squadron Bombing Leader F/L D.W. Haseldine (DFC) was on this operation, he also was injured during the crash, his injuries were described as minor. Pilot Officer Eyjolfsson has completed many operational sorties, throughout which his fine leadership and skill have been outstanding. In March 1944 he was detailed for an attack on Aulnoye. Just before reaching the south coast of England one engine of his aircraft failed but with great determination this officer flew on and reached the enemy coast where the port inner engine also failed necessitating the abandonment of his mission. Displaying superb airmanship he returned to this country where he made a masterly crash landing. At all times Pilot Officer Eyjolfsson has shown great determination pressing home his attacks irrespective of enemy opposition or adverse weather. He was an instructor at Boundary Bay, B.C. Airport. And later was with the Vancouver Fire Department. On June 21, 1947, Hilmar married Ruth Jonescu at Vancouver. They have one son.